Following the nearly nine inches Washington Court House received over the weekend, this coming weekend could see more snow and even colder temperatures. During the recent snow storm, Shaleigh Adams and her twins took time to enjoy the weather with a little snow nap. See more winter weather photos on page 5 of today’s edition. Residents of Fayette County will continue to feel the impact of winter weather with the potential for more snow this week and weekend. Following a blanket of snow this past weekend measuring around nine inches of accumulation in Washington Court House, the community has continued to remain cold with temperatures around 30 degrees for both highs and lows so far this week. According to weather.com, this will begin to change Thursday with the temperature moving up slightly to around 37 degrees during the day. Precipitation should be expected Thursday — currently a 90 percent chance during the day and an 80 percent chance during the evening — in the form of a rain/snow mix. The mix will change to all rain in the afternoon with freezing rain possible. Winds will blow from five to 10 miles per hour and snow accumulation is expected to be less than one inch. Light rain is expected early in the evening hours. Friday is currently expected as the most mild, though it will still be cold with a 33 degree high, a 28 degree low and and winds blowing up to 10 miles per hour all day. Currently, weather.com is watching for the potential of another winter storm coming on Saturday. The wintry mix could begin early and the precipitation will change to a mixture of rain and freezing rain for the afternoon. Winds will blow between 10 and 20 miles per hour. Currently, the chance for precipitation is 90 percent, and about one inch of ice and snow accumulation is expected. In the evening Saturday, the winds are expected to pick up to a potential of 30 miles per hour. Snow showers are forecasted late with three to five inches of snow and ice expected. Though the bulk of precipitation is expected to be over by Sunday, residents should bundle up for one of the year’s lowest temperatures currently forecasted. As of Tuesday, the high for Sunday is expected to be 16 degrees and the low could fall to negative 3 degrees. A few flurries or snow showers will be possible and winds will remain above 10 miles per hour — up to 30 — the entire day. Monday, Jan 21 is expected to be similar with a high of 10 degrees and a low of about 6 degrees, but currently no precipitation is expected. https://www.recordherald.com/wp-content/uploads/sites/27/2019/01/web1_TwinsInSnow.jpgFollowing the nearly nine inches Washington Court House received over the weekend, this coming weekend could see more snow and even colder temperatures. 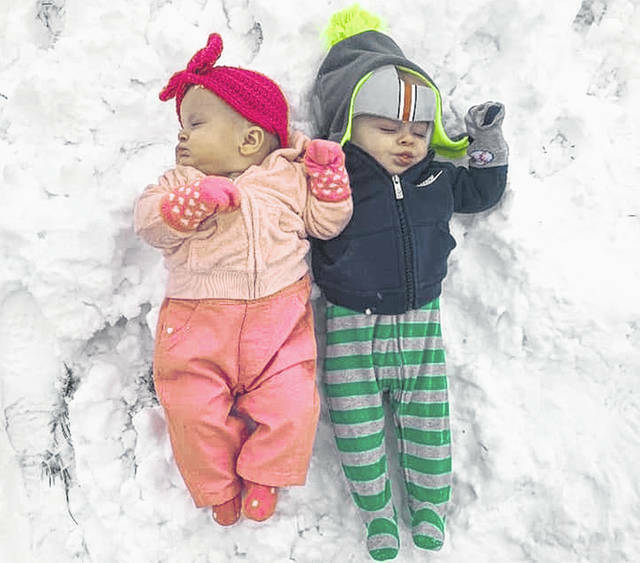 During the recent snow storm, Shaleigh Adams and her twins took time to enjoy the weather with a little snow nap. See more winter weather photos on page 5 of today’s edition.